We know that today’s Cisco Aironet Outdoor access points include Cisco Aironet 1570 Series, Aironet 1550 Series, Aironet 1530 Series. In the last article we introduced Aironet 1570 Series, you can read the “The New Cisco Aironet 1570 Series Access Point” to know more about this Outdoor AP. If enterprise customers are looking to expand their wireless coverage and provide seamless network access from indoor to outdoor areas, they can consider the Cisco 1530 outdoor access points. They are small enough and light enough to be unobtrusively mounted on street light poles or building facades. The integrated antenna version is just 9 x 7 x 4 inches (23 x 17 x 10 cm) and weighs 5 pounds (2.3 kg). A solar shield/cover option is also available, and can be painted to match its surroundings to allow the access point to be even less noticeable. ● Cisco Aironet 1532I (internal antennas): The Cisco Aironet 1532I Outdoor Access Point is a low-profile, lightweight model in the Cisco Aironet 1530 Series. The smaller size and sleeker look helps it blend in with the surrounding environment. The Cisco Aironet 1532I access points are dual-radio systems with internal antennas and comply with IEEE 802.11b/g/n (2.4 GHz) and 802.11a/n (5 GHz) standards. The 2.4-GHz radio is a 3×3 multiple-input and multiple-output (MIMO) radio that supports up to three spatial streams. The 5-GHz radio is a 2×3 MIMO radio that supports two spatial streams. 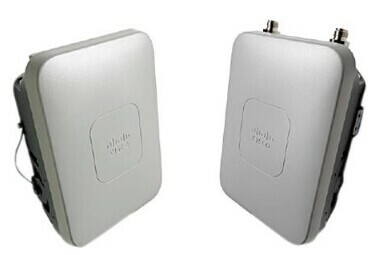 ● Cisco Aironet 1532E (external antennas): The Cisco Aironet 1532E Outdoor Access Point is also a low-profile and lightweight model, but it supports a flexible radio coverage area through the use of external antennas. 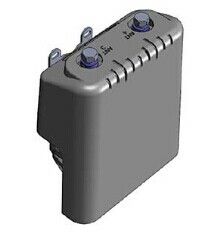 With the unique Cisco Flexible Antenna Port technology, the antenna ports can be software configured for dual-band or single-band operation. AIR-CAP1532I-x-K9 802.11n Low-Profile Outdoor AP, Internal Ant., x Reg Dom. AIR-CAP1532E-x-K9 802.11n Low-Profile Outdoor AP, External Ant., x Reg Dom. The “x” in the above table is a placeholder for the regulatory domain designator. Please see https://www.cisco.com/go/aironet/compliance to determine which regulatory domain is used in your country. Note that the regulatory domain used in your country might differ depending on access point model and that some models are not available for all countries. The Cisco Aironet 1530 Series access points can connect to the network wirelessly or through a wired Ethernet connection. Wireless: An access point that connects to the network through another access point over a wireless backhaul is known as a mesh access point (MAP). The backhaul radio is built in, and no wired connection is needed for MAPs. An access point that acts as the gateway for mesh nodes is known as a root access point (RAP). RAPs connect to the network through a wired Ethernet connection. In these cases, a liquid-tight adapter is provided with the access point to seal the cable entry. Ethernet: The Cisco Aironet 1530 Series supports 10/100/1000 Gigabit Ethernet using a shielded RJ-45 connector with minimum Category 5 cable. Please see your local supplier for an outdoor-rated cable and shielded connectors. *When the Cisco Aironet 1532I is powered using Enhanced PoE (PoE+) power, the access point will automatically disable one of the 2.4-GHz transmitters. AC Power: To power the Cisco Aironet 1530 Series from an AC power source, an external AC/DC power adapter is required. When powering the Cisco Aironet 1530 Series from streetlight power, please note that the maximum voltage is 277 VAC and requires the power adapter and the street light tap. Table 3 lists the power adapter and tap part numbers. Power over Ethernet: The Cisco Aironet 1530 Series can be powered over the Ethernet connection. Power can be sourced directly from an appropriately powered switch port or from an inline power injector. You must also specify the country type power cord for the power injector. The AIR-PWRINJ1500-2= and AIR-PWRINJ-30= power injectors are for indoor environments only. The Cisco Aironet 1530 Series access points use a standard RJ-45 Ethernet connector. Cisco does not provide an Ethernet cable for the Cisco Aironet 1530 Series. You will need to source an outdoor-rated, Category 5 or better Ethernet cable and shielded RJ-45 connectors from a local supplier. A liquid-tight gland is provided with the access point to seal this cable entry point from weather. DC Power: The Cisco Aironet 1530 Series access points support power from an external 24 to 57 VDC power supply with a minimum of 30 watts (W). A terminal block is included with your access point for this purpose, with liquid-tight adapter to weatherproof the connection. When using DC power, please consult the hardware installation guide for instructions on how to correctly assemble the connector. Antennas: The Cisco Aironet 1532E access points are equipped with a combination of radios operating in the 2.4- and 5-GHz bands. Both radios can support two transmit and two receive streams using Maximal Ratio Combining (MRC), which takes advantage of multipath signals received across the two antennas to improve signal quality. It describes the antennas available for the Cisco Aironet 1532E access points, listing part numbers for the antennas as well as gain and other details. For additional antenna specifications, see the Cisco Aironet Antenna and Accessories Reference Guide. The access points are provided with a moldable sealant to protect the antenna connector from weather. Consult the installation guide for proper installation. Lightning Arrestors: When you use cables between the antenna and the Cisco Aironet 1532E access point, Cisco recommends that you add lightning arrestors to each port, particularly when the deployment is in an area with high lightning activity. The lightning arrestor listed in the following table provides robust protection against induced currents in the RF cabling generated by nearby lightning strikes. Note: The lightning arrestor does not protect against direct lightning strikes on the access point. Cisco Aironet 1530 Series outdoor access points can be mounted on poles or walls.The standard vertical, pole-mounting brackets can be ordered as an option or as a spare. The mounting brackets with tilt mechanism can be ordered separately as a spare. Both pole-mount kits include two sets of stainless-steel bands to fit poles from 2 to 8 inches in diameter. For larger poles, consult a local provider. The Cisco Aironet 1530 Series requires the minimum software releases noted in the table as follows. Additional functions are available for the access points with more recent releases. Please see the applicable release notes for more information about features available with newer releases. 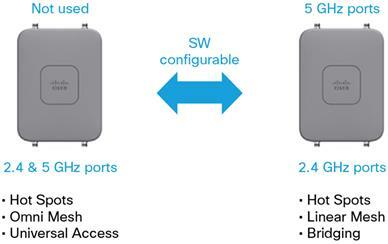 Software Ordering Option: Cisco Aironet 1530 Series access points can be deployed in unified or autonomous mode. The access point boots in the default mesh mode and can reboot in autonomous mode with a command-line interface (CLI) command. Both unified and autonomous images are included in the software part number in the following Table. Cover and Solar Shield: Cisco 1530 Series outdoor access points can be deployed with an optional paintable cover to enable the access point to blend into the surroundings.